Although we hope you love everything that you see offered on our website, there are those times when the exact item to fit your needs just cannot be found. If you don’t see what you need amongst our offerings, we are pleased to be able to assist you in designing customized soft furnishings through our Custom Soft Furnishings Program. Pine Street Natural Interiors will create your custom soft furnishing items with totally chemical-free materials, including pure, natural latex foam, organic wool or cotton batting and pillow forms filled with kapok, organic cotton or organic wool. We use only formaldehyde-free wood products, when required for our custom soft furnishings. We can assist with your choices of these products as well as the design details. Our work rooms specialize in custom fabrication services. Challenges are welcome, so please bring your unique items and ideas to us. With custom the possibilities are boundless. Choose your fabric, choose your details - we will make your design a reality. 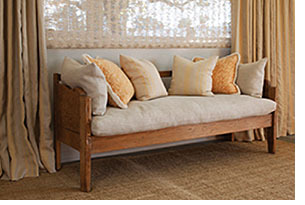 Our custom organic and sustainable soft furnishings complement any décor. Choose from any of the fabrics shown in our fabrics section. Our custom cushions and chair pads can be created in any shape or style. Bring in your template or contact us to discuss your needs. A member of our team will be happy to meet with you to discuss your project. We will provide a formal estimate, measure & inspect your fabric upon receipt and follow your project throughout the fabrication process. We offer additional services including visiting your home to take onsite measurements, and complete the installation to ensure the furnishings showcase as they were intended. Attention to detail makes our soft furnishings workroom special and they are steadfast in their commitment to fulfilling your desired outcome.